Shop drawings illustrate some portion of the architectural project. 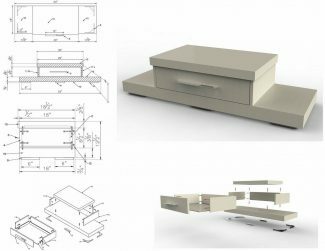 Shop Drawings focus on manufacturing methods and details.Shop drawings is not a copy of the architectural drawing set. For that reason drawing set provided by contractor or the manufacturer. The main object is to show how the contractor plans to meet the intent of contract’s design requirements. Let s take a simple steel column joining as a sample case. Existing drawing set shows rectangular steel mounting plate with 1/2 diameter bolts. It does not mean we have to do same. If the mounting condition is better to go with circular base plate show that on your shop drawings set. You might me uncomfortable for the 1/2 bolts. Your experience says ” use 5/8″.. So do that. It is shop drawings. We can also provide DXF files for CNC cutting. It is really important to discuss your expectation with us at the very beginning of the job. We would like to guarantee your satisfaction. Please look at following drawing terms. Each one represents different details of the same product. Those are Erection Drawings, Fabrication Drawings, Final design Drawings and Shop Drawings. Shop drawings related with manufacturing way. Joining and finishing details are important part of the shop drawings set. Our focus point supposed to show more about the fabrication methods than to show overall views. You can easily reach product finishing, overall dims, locations, joining information at the drawing set. Shop drawings need to indicate real site dimensions. We would like to talk more about the drawing sets but the other details change by the manufacturing sector. It is not limited with that list but usually Steel, millwork , windows, staircase & railings , metal cladding, skylights, stainless steel products and HVAC systems use shop drawings. We are ready to provide any kind of Shop Drawing Services for your next project. Architect will highlight all the provided details. They will compare provided information with the specifications and the other related drawings of project. The purpose of the shop drawings is to describe the specifications of the materials, the joining details, overall and detail dimensions of the product. If we like to have a successful installation and satisfied client, communication pattern needs to be clear between the parties. We always recommend to check all shop drawings set double time before the emailing 3rd party. The shop drawings need to be exact. It is really hard to turn back after approved shop drawing set. It costs wasting time and money. 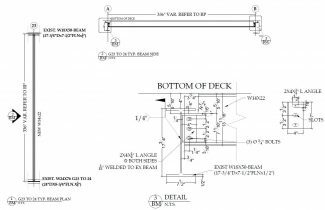 Shop Drawings Services ready to prepare your next drawing set. Please contact us for any question about your next project. Or you can call and visit our shop drawings office.